It is impossible to talk about the remains of Early Christian structures without talking about their founders and how Christianity transformed the very landscape of Ireland. 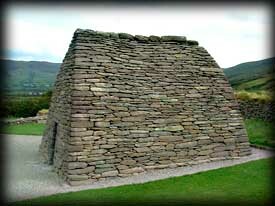 Megalithic tombs, stone circles and standing stones were replaced as places of worship by wooden churches and monasteries. 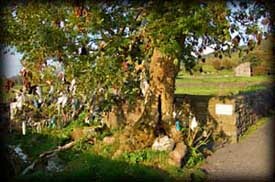 In fact, many pagan sites such as sacred wells were Christianised by associating them with a local saint and many standing stones were coverted into ogham stones. Although there is evidence that bullaun stones existed prior to the spread of Christianity, they are now mainly found at Christian sites. It is commonly believed that St. Patrick brought Christianity to Ireland, but there is evidence that Christianity was introduced prior to St. Patrick's arrival. Some of the first Christians coming to Ireland would most likely have arrived by sea directly from Gaul or through Wales where earlier monks from Gaul set up in the fourth century. The most likely landing would have been along the south coast and Christianity then spread to the north. A saint active in this area during the early 5th century was St Declan who founded a monastery in Ardmore, County Waterford. Irish Christians were sufficiently numerous by 431 to justify Pope Celestine's appointment of St Palladius as Bishop of Ireland, a year earlier than St Patrick is believed to have arrived in Ireland. Most of St Patrick's missionary work appears to have taken place north of a line running from Galway to Wexford and most of the churches acclaimed as founded by St Patrick are situated in this half of the country. The earliest church government would have been episcopal in nature, with bishops of fixed sees exercising jurisdiction within a diocese. By the end of the sixth century the new monasteries had ousted many of the older Patrician foundations as the important centres of religion and learning. By the eighth century Ireland became unique in western Christianity in having its most important churches ruled by a monastic heirarchy lead by abbots rather than bishops. Although St Enda's monastery on Inishmore in the Aran Islands schooled many of the first Irish abbots, it was soon eclipsed by the monastery of St Finnian at Clonard which emphasized sacred study. So great was this school that St Finnian was known as the "Teacher of the Saints of Ireland" and his students became "the twelve apostles of Ireland". Each of the apostles founded their own monasteries - Colmcille in Durrow, Derry and Iona, Ciaran in Clonmacnoise, Brendan in Clonfert, Molaise on Devenish Island, Canice at Aghaboe and Mobhi in Glasnevin, to name a few. 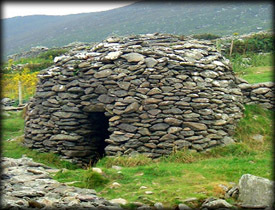 A bullaun is a deep man made bowl-like depression found in boulders and stones. 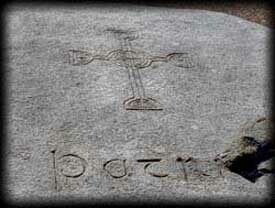 Although pre-dating Christianity, the vast majority of bullaun stones are associated with Christian sites. The rainwater that collected in many of these bowls was thought to have certain healing properties. Indeed some of the stones are known as the Wart Stone or the Eye Stone. Many of these boulders have multiple bullauns and some may contain a water-rounded pebble known as a curing or cursing stone, see Killinagh below. T Plunkett & M Cruise Rathmore.